Get your students moving! Sign up to participate in Walktober 2018 to help promote healthy living, start important conversations about the environment, and win great prizes. Participating can be as simple as promoting walking and biking through school announcements or newsletters, hosting a school-wide walk, or organizing a clothing or shoe drive. We have the resources you need to make it happen. International Walk to School Month is over for 2018! Hope we see you next year. 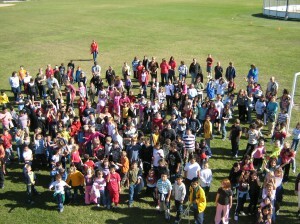 Walktober, previously known as International Walk to School Month, is an annual event held in every year. 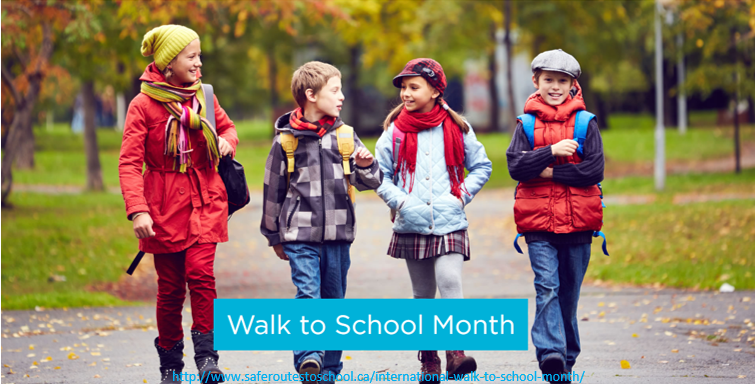 Schools can participate for a day, a week, or the entire month, during which the school or individual classrooms host fun activities to encourage students to walk and to address barriers to walking in the school community. We have ready-made resources and event ideas to make it easy for coordinators to find something that suits their school. Click on the “Register” button, just above this FAQ! Fill out the short form and we will be in contact with you to the event! Decide which pilot projects or one-time events could address the barriers unique to your school. Some of the following ideas might be helpful: Participating in the Let Grow project, Inviting us to do a mythbusting 15-minute presentation to your parent council, Surveying parents on their concerns around walking in the neighbourhood, Holding class walks with a focus on pedestrian safety, Designating Walk-a-Block Zones where students can be dropped off and walk a short way (works for buses, too! ), Starting a once-weekly Walking Wednesday, and Testing a weekly Walking School Bus route. Choose any full week in October (we suggest October 22-26) to collect student travel data with BikeWalkRoll. All it takes is 30 seconds from each homeroom class in the morning, and the app automatically compiles the data for your school and school division so you see how your school is doing compared with other schools and how travel modes are shifting over time. Alternatively, this survey can be done on paper and compiled later, batch scanned, and submitted as a collection of images. Get others involved and make it happen! After Walktober ends, complete the short evaluation so we know what’s working and how we can improve. Why should I do Walktober? Children’s health. Children need activity to develop physically and mentally, but they are sedentary like no generation before them, which has led to an increase in associated health conditions like depression, obesity, and sleep irregularities. Fearing for kids’ safety has also led to a sharp curbing of childrens‘ freedom to explore their neighbourhoods independently. The environment. There is an urgent need to reduce our energy use and shift away from fossil fuels, to minimize the impacts of climate change and air pollution that can affect the development of young bodies. Strain on teachers. Being active in the morning is proven to increase children’s ability to focus, improving behaviour and academic performance. Walktober helps address these problems by allowing schools and students to make a temporary commitment to walking. This can be anything from piloting a walking school bus to designating a drop-off and pick-up area away from the school to reduce traffic congestion. Even small events start conversations about the barriers to walking in the community, such as traffic concerns, lack of safety training, and streets poorly designed for youth and children to get around independently. The momentum from events like this can carry into discussions about making active travel easier all year. What about kids that can’t walk? Walktober is an inclusive event, and all forms of active transportation can be encouraged—we like to use “rolling” as a catch-all term for any wheeled mode of transportation that also includes wheelchairs and other mobility aids. For kids who live too far to walk regularly, drop-off zones can be set up to allow children to walk part-way or to join groups of friends who live closer to school. I don’t have the time to do this by myself, but I’m interested! Can you help? Absolutely! We provide ready-made resources and activity ideas for teachers, but our events are not prescriptive! We encourage teachers to scale the event based on what resources they have available. A strong “Walk to School” day or week with lots of support and teacher buy-in will likely have a greater impact than more diluted messages over a long period. Many schools have put on successful “transportation weeks” where they explore many different modes of sustainable transportation, including transit. No matter what, we recommend engaging your school community fully: your school’s parent council, sustainability committee, or student green team for help in planning and promoting your events. You are entered in our prize draw when you complete our short feedback form after the event, which includes participation numbers. You also get an additional entry for every school you refer to participate. We make sure that schools outside of Winnipeg won’t be stuck with prizes only redeemable in the city. We have some great tools and resources to help guide you in making Walktober a success. For handouts event ideas, and curriculum tie-ins, visit our Resources for Teachers Page. Remember, you can only win prizes if you register above! 1) Sports Fandom — Jets gear and more! 2) Pizza Party — A treat for your class! 3) All Fun and Games — Board games and passes to fun attractions! 4) Walk to School in Style — Outdoor active living gear! Event Presence: We’d love to join you for your active transportation event! Contact active.events@greenactioncentre.ca to see if we can celebrate with you or give a walk-to-school pep talk to your classrooms! Air Quality Health Index Workshop: Using high-tech tools that measure air quality around your school, this presentation will engage students in discussions on ways to improve air quality with more emissions-free travel, including cycling and walking.